Signal aims to deliver successful projects working with the communities in which they occur. This could be a rural community mural, a corporate graffiti workshop, or a large street art regeneration project. Although many companies trade on the credibility street art now holds, Signal is unique in successfully catering to all audiences involved, not just those paying for it. The company has developed projects with young offenders involved in graffiti to develop positive diversionary activities, and with excluded and at-risk young people to channel creativity and give ownership in areas where they have previously had little or no say in what goes on. Artistically Signal has a policy of collaborating with leading national and International artists to create work of the highest professional standard, regardless of the level of non-expert participation. We will not undertake work we do not feel can be delivered to a professional standard. Sonia Blair, Managing Director of Signal, gave evidence at the GLA’s Investigative Report into Graffiti in January 2002. Her evidence was largely in relation to introducing legal graffiti projects around London working with excluded youth. 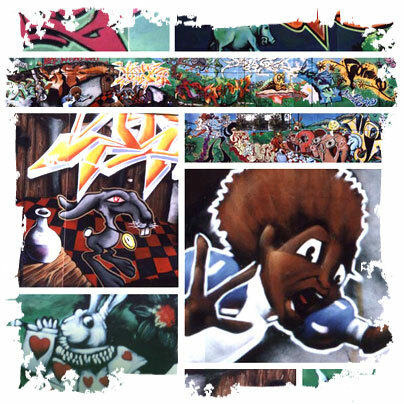 The Report, launched in May 2002 at a wall organised by Sonia and other artists in Stockwell Park Estate, influenced the recommendations the committee made in regards to policy towards graffiti in London. Signal understands and manages the diverse objectives of commissioning and/or partnership organisations, the concerns of the communities, the needs of any young people involved, in addition to facilitating communication channels for youth workers and meeting the artistic and professional standards of the artists. Signal prides itself on its professional approach and has proven time and time again that we can successfully project manage for large clients to deliver on time and on budget. Personal safety and environmental impact awareness is essential when working with paints and chemicals. Signal use protective clothing where appropriate, and is actively reducing the use of spray paints. We are aiming to use low or zero content VOC paints and recycled materials where possible. Our Health & Safety policy is in effect at all time on projects, and risk assessments can be completed prior to starting all work. Signal takes its legal and moral responsibilities seriously. Download the Adobe Reader to open PDFs.